Owen Pearson is a freelance writer who began writing professionally in 2001, focusing on nutritional and health topics. After selling abstract art online for five years, Pearson published a nonfiction book detailing the process of building a successful online art business. Pearson obtained a bachelor's degree in art from the University of Rio Grande in 1997. Essential oils, commonly used in alternative medicine, are thought to help alleviate the symptoms of a variety of conditions. These include depression, anxiety and muscle tension. 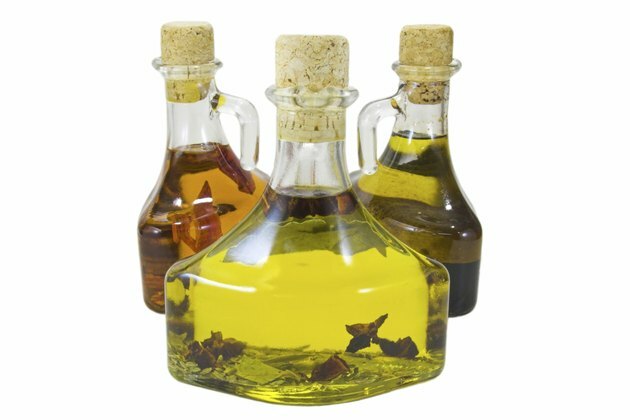 These oils are also commonly used in incense and as fragrances for household products and cosmetics. Clove oil is a popular essential oil because of its distinctive, pungent aroma. However, some alternative medicine practitioners believe clove oil has toxic properties. Clove oil is an essential oil derived from the clove plant, or Syzygium aromaticum. The clove plant is a slender evergreen that can grow up to 40 feet high. This plant, native to China and Indonesia, was brought to the Western world in the fourth century, according to Michael Castleman, author of "The Healing Herbs." Widespread use of clove and its oil began in the early 16th centrury, when Magellan brought large amounts of the herb to Spain. Clove oil is produced by two separate methods, according to Julia Lawless, author of "The Illustrated Encyclopedia of Essential Oils." The flowers and leaves of the clove plant are soaked in water and heated to extract their oils. The stalks and stems are suspended in a container and steamed to release oils into the container. The result is a pale yellow liquid with a spicy and slightly sweet aroma. During the Han dynasty in the first century, people who visited the emperor were required to keep cloves in their mouths to mask breath odors, according to Castleman. Clove oil is also used in Traditional Chinese Medicine to treat diarrhea, indigestion, ringworm and hernias. Ayurvedic medicine practitioners in India use the plant and the essential oil to treat digestive problems and respiratory ailments. Clove oil is thought to destroy bacteria in the intestine, and may also be used as an oral disinfectant. Manufacturers add clove oil to soft drinks and alcoholic beverages as a flavoring agent. Clove oil also appears in perfumes, toothpastes, soaps and cosmetics as a fragrance. According to Castleman, clove oil contains a compound called eugenol, which is thought to promote the growth of cancerous tumors. Eugenol and other compounds in clove oil may also be toxic to the skin, causing irritation to the skin and mucous membranes. Clove oil may also promote dermatitis, Lawless says. Although clove oil contains lower levels of eugenol than other tree oils, it should only be used in low concentrations. Lawless recommends diluting the clove oil in alcohol or a carrier oil and limiting the concentration of clove oil to no more than 1 percent. This may help reduce the toxic effects of eugenol. Are There Bad Side Effects of Lavender Oil?